Alessandro Alessandrini (guitar, vocals) and the rest of the E.Z. Riders band is one ocean and a sea away from their roots. This Italian trio play music steeped in a distinctly (American) southern country rock tradition with a nod to classic rock of yesteryear. Listening to the self-produced disc is like taking a road trip from Nashville to Gainesville, then passing through New Orleans before heading to Austin, and then finally drifting (lazily, of course) through Memphis until back in Nashville. Considering the breadth of their music and the latent blues influence, E.Z. Riders could have also buzzed over to Kansas City or even Chicago along the way. 'Experienced Zydeco Riders' is truly homegrown: the production is shoestring and soft, the artwork totally Photoshopped, and the pressing is a simple CD-R with an inkjet label. However, whatever they lack in formality, E.Z. Riders makes up in song composition and musicianship. Their knowledge, skill and enthusiasm for their chosen style is abundantly evident as on The Way Of The Heart, I Should Have Quit You, and my personal favorite, I Do As I Please. Alessandro Alessandrini is quite the guitar slinger (but a dubious singer), and the rest band is tight and steady. E.Z. Riders's 'Experienced Zydeco Riders' is a hidden gem, totally unexpected and highly enjoyable mixture of country, southern, and melodic hard rock. Given some cleaner, crisper production oversight and, possibly, the addition of a dedicated lead vocalist, E.Z. Riders could easily become a break out act, even finding an audience among fickle Americans. A major label should latch on to these guys and not let go. Good stuff. E.Z. 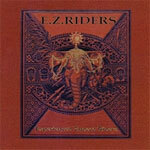 Riders's 'Experienced Zydeco Riders' is a hidden gem, totally unexpected and highly enjoyable mixture of country, southern, and melodic hard rock. A major label should latch on to these guys and not let go. Good stuff.